Let’s get this out of the way. 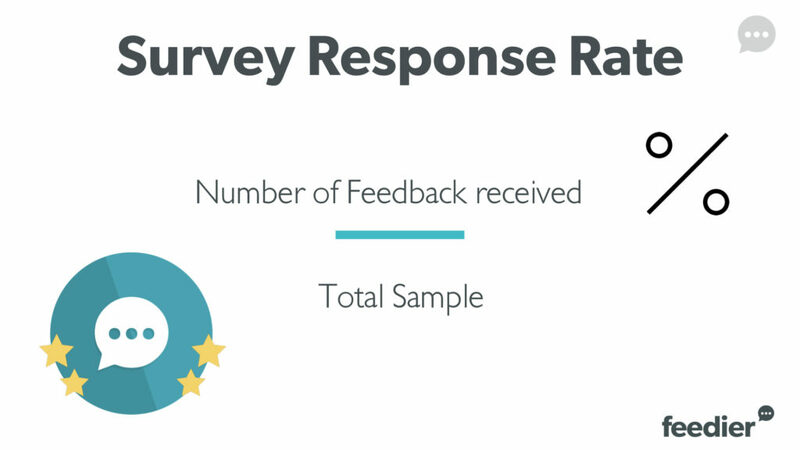 There is no rule of thumb when it comes to a good survey response rate. A good place to start is by establishing a baseline from general benchmarks and your own data. From there, begin noticing trends through your experiments. Find out what is working and improve from there. What makes a good survey is an insightful feedback you receive that helps fuel your business growth. The ultimate ingredient to make your business a successful venture is to understand what your customers want. And what better way to gather such insightful data than online surveys? Online surveys are basically questionnaires that the customers or recipients complete through email, your website, social media, message apps or other internet channels. The responses are integrated with a database and statistical software, to store and interpret data, respectively. And in today’s combative world where everyone is running towards being an industry leader, data becomes the holy grail. And the online survey is among the best ways to obtain and curate data. Most companies do feedback surveys that don’t give any actionable results. They do it the wrong way. Customer feedback is at the center of every organisation, it is more important than ever before. However, few companies are actually collecting valuable and actionable data. A typical business only hears 4% of its dissatisfied customers. Which is very impeding in terms of improving the overall customer experience. Conducting proper and well-designed questionnaire will go a long way. Let me give you the gist of it. If the purpose of your survey is to collect feedback from your customers, then your customers feel heard. Moreover, they feel that you care and want to improve your product or service based on their response. This leads to improved customer satisfaction and experience. Conducting online surveys is one of the cost effective ways to gather data. And having an ample amount of data can help you stay ahead of your competition. The main advantage of conducting surveys online is that you can target your audience across the globe. Unlike other types of surveys, like calls or focus groups, you can reach your customer direct with the same effort if she is in Europe or Asia. But conducting surveys is not a cakewalk. There are many variables that’ll take your ROI to zero, or negative. One other agony of online surveys is manually updating the survey information into the CRM to make sense out of the data. Theoretically, you should only have to do this once if your feedback software integrates with your CRM, has an API or connects with Zapier. Keyword being SHOULD. Gathering data is always the easy part of the equation. The hard part is interpreting the data gathered. The biggest adversity while conducting surveys is not receiving a statistically significant number of responses. The lower the number of responses rate the harder it is to conclude the data received. First thing first, let’s define what is feedback and how it can help your company. Customer feedback corresponds to your customers’ opinion, voice about your products or services. They are comments or remarks that guide but also lead your decision making and influence your roadmap. It also helps you measure your customer satisfaction and simply build a product or service your clients, customers or users want! 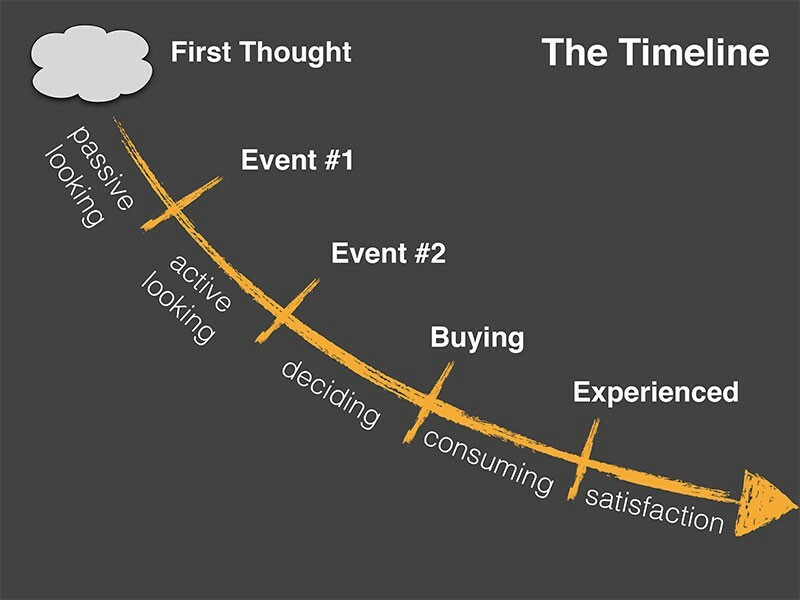 The earlier in the customer journey you collect them, the better! Having a crystal clear understanding of how your customers view and feel about your company is a must when it comes to growing your company. There are different ways and channels to collect those feedback and we are going to focus on the customer surveys today. Before you start collecting feedback from your customers, you need to make sure you have clearly defined why you are seeking them. Shaping the overall process and the desired results are essential. Otherwise, you will collect non-valuable feedback and simply clutter your understanding. Feedback Surveys are one way of asking for feedback. Other methods include a phone call, an interview, or a simple feedback question. 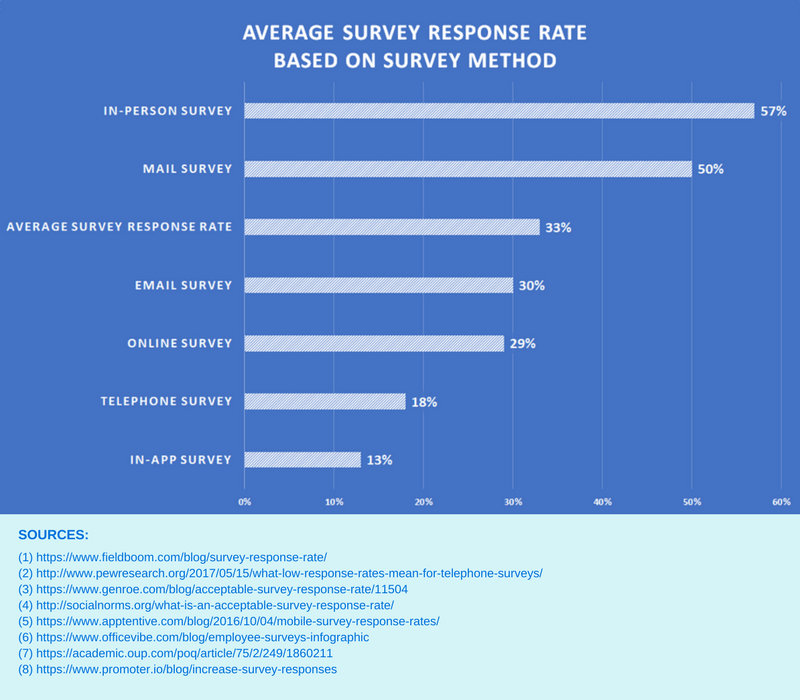 What Is a Survey Response Rate? It is also known as the return rate or completion rate. I’d take this number a bit farther. Because we know that not every response is actionable. Some responses will be total junk. And it’s important you review each before to weed out the good and the bad to give you the most actionable data. Before we get into actual numbers, you must first incorporate best practices to give yourself the best opportunity for a high survey response rate. Remember, your first ask for a customer survey may be your last. Make your first ask is the best it can be by following the tips provided below. What cannot be understated is survey length. 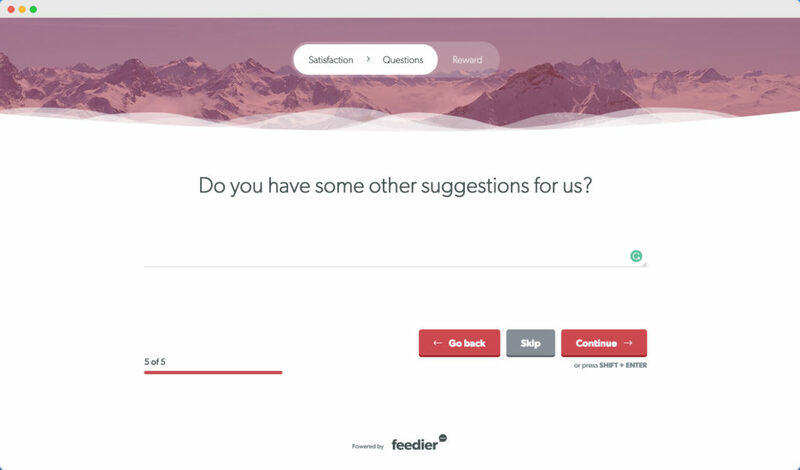 According to Feedier’s own research, a shorter, more concise survey will net you a better response rate. Survey duration matters. 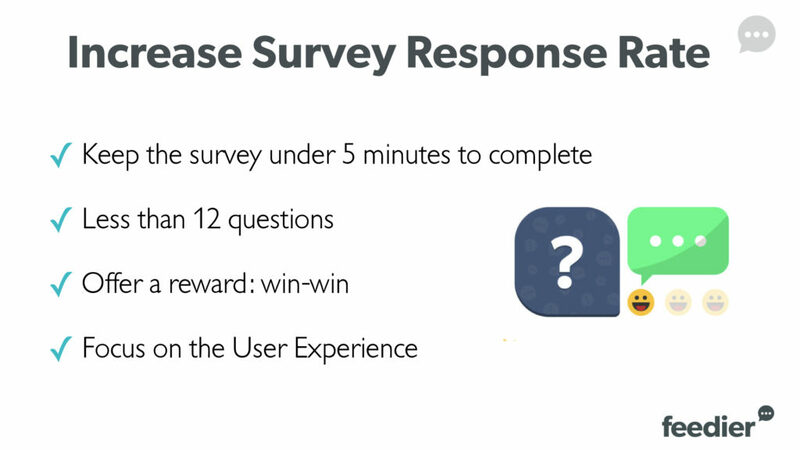 If your survey has 12+ questions or takes over 5 minutes to complete, you can expect a 17% decrease in response rate. More importantly, incentivizing the respondent with something of value often leads to more thorough completions. These are the responses that give you the data you need to make decisions. You’re likely acquiring new customers each and every day, and you need to get to know them. That’s the first step to the optimisation of your questionnaire response rate. You — hopefully — have a hazy idea of you’re targeting, but you really don’t know, at this stage, how and when to speak to your customers. We are trying to build the timeline which depicts the different milestone or events our customer stumbled into on their way to the conversion. We’ve already begun getting them used to the feeling of remembering, now it’s time to jump back to uncover their first thoughts, but we need to figure the right time to talk to them. What language is he speaking? Speaking in the same language matters a lot and will, without any doubt, increase your chance of getting results. Is he likely to come back? How often is he likely to use your product or services? By getting some answers to the above questions, you will simply figure out which channel or customer touchpoint to use in order to share and show off your survey, and thereby, get feedback from your customers. But also at what time should you ask for feedback. If you have identified several groups of typical customers — also known as a cohort, don’t hesitate to work on those separately. You will, therefore, figure out if you are better off pushing your feedback request, or if you can let your customers come to you. The goal is to simply tell him that you collect feedback because you value his opinion, consistently making improvements to your services based on what he or she has to say. As a matter of fact, if your customer is expecting a survey, he is way more likely to answer — which means higher response rate. By doing this, you not only come across as a very customer-centric organisation but can also bump up your survey response rates close to 100%! No matter who your customer is, ask him its feedback straight after they have interacted with your business will give you better and more relevant feedback. The experience will be fresh in their minds and they will be more honest as a result. It also means that if they’ve had a problem you can act on it straight away, so you don’t lose a customer or get a negative online review. This way, you simply reduce your likeliness of churn by understanding what your customers want. From there, start thinking about the flow and consider incorporating these tips. Today’s information-crazy audience doesn’t have much patience. Pay extra attention to the length of your survey. Around 80% of the customers abandon the survey halfway through. Hence, to get the best out of the surveys, make sure you optimize the survey length. The other factor affecting the survey response rate is the design. If your survey is not compatible with all the devices than the survey takers will abandon. The best fix for this problem is opting for a good survey plugin which will not only help you design amazing surveys but will also integrate with your CRM. Such CRM survey tools eliminate all the tedious work of manually entering the data. This you might already know. Offering something valuable in exchange for the time of your customers is a sure shot way to increase the response rate. 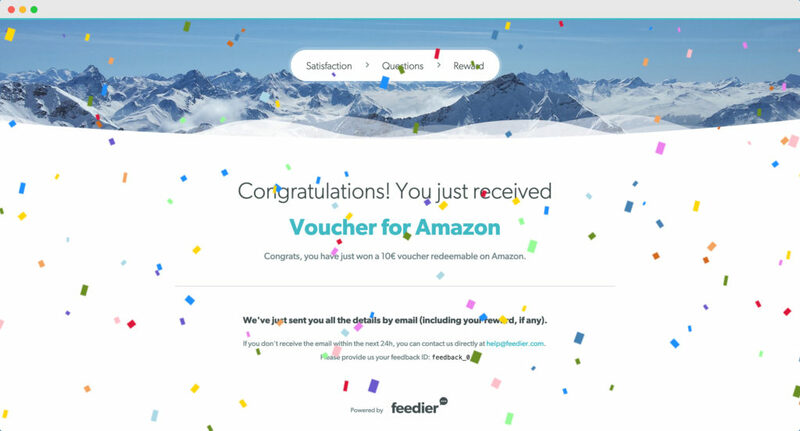 With Feedier, for example, you can offer vouchers for your shop, Amazon gift cards, online resources, ebooks, or other rewards of value. We want to level the playing field and implement a two-way flow by rewarding our customers for their precious time. The idea is to automatically offer them an incentive. Consider giving the option to go anonymous to your customers when conducting a survey can make them feel comfortable to put their honest thoughts in the survey. A study found that 87% of the survey-takers want to have a say when it comes to deciding future products or services of the company. So, make sure to add a space in your survey where they can suggest or put their thoughts about your company. You can also give 1-2 open-ended questions to give the customers the freedom to say whatever they want to. We usually refer to this as a one-way flow. You’re asking your customers to fill in your survey with as many details as possible, but you aren’t giving anything back. So you end up with no feedback at all, or literally too many details from your aficionados — or the 2.5% of your client base. Besides this, what does it feel like to answer a sketchy and boring survey? Most of those surveys are usually standard, we have seen that dull and impersonal stuff over and over again. In this busy world, I want nothing but something where I feel valued, targeted, respected and listened. I don’t want to give away an unknown amount of time for feedback that will, maybe, be reviewed. To engage your survey-takers and increase the completion rate of your surveys, it is advisable to keep the questions as interactive as possible. 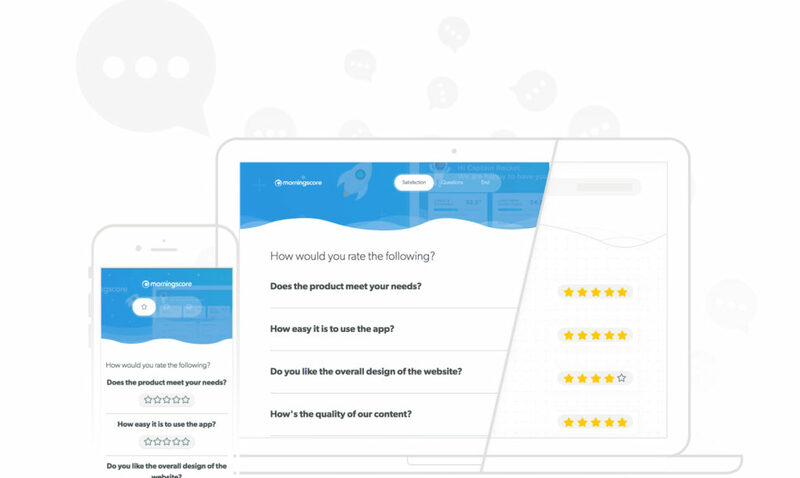 You can add images, multiple-choice questions, smiley rating questions, scales, advanced gamification features, and more. Before sending out your survey, make sure there are no grammatical errors and that all the questions are easy to understand. Avoid using any technical jargon as you don’t want the customer to read the question twice just to understand the meaning. Also, check the links before sending the survey. A survey about sweets is redundant to a person who doesn’t like sweets. Considering adding a few sentences about the agenda and what they can expect from the survey. Additionally, you can make use of an amazing feature called Apply Skip Logic which is available almost every CRM survey tool. What this feature does is redirects the survey-taker to the next relevant question or to the end of the survey according to the predefined conditions. Showing the length and progress of the survey is essential makes it more interactive and boosts the morale of the survey takers to finish the survey. This theory basically states that in a male-dominated environment, a female sender will get a higher survey response rate. This is worth testing and dependent on your audience. It’s human behavior to do something in exchange for something. A popular practice is to give incentive first and then ask them to fill the survey. Reciprocity is a behavioral norm that people will treat others as they have been treated. So, if you provide incentives first, chances are that they will be grateful and complete the survey willingly. Begin experimenting with the above tactics, and add your own based on your expertise and industry. And don’t forget to end your survey on a grateful note! It’s time to go against the status-quo and gamify your customer’s experience. How to go about it? The point is to simply stand out from the mass and provide something enjoyable! 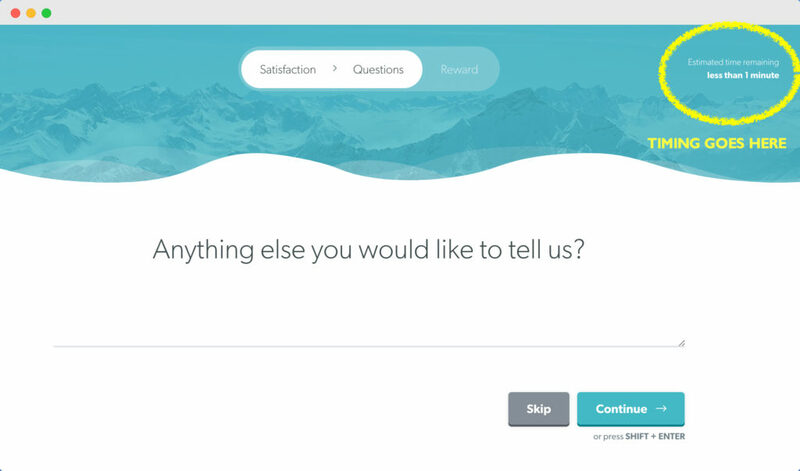 We also want to brand and personalize our feedback carrier to match our organization. It means, at least, add our logo and our colors. Every customer is on their own unique buying journey. Their motivations to try, buy and stay loyal change depending on the individual making the choice. The more personalized the experience, the happier the customer. You should have a clear idea by now of what you could ask your customer in order to improve his experience and what you’re offering him. That said, some of your questions might not be relevant to every single customer. For instance, let’s say you have an eCommerce website, and you want to know how your customer feels about your online support and overall website smoothness. Based on his answer, on the one hand, it will make more sense to ask him how you could serve him better only if the rates your support less than, let’s say, 3 out of 5. On the other hand, for the happiest customers, you’re better off asking them what makes them so thrilled about your services. This way, you will likely pull key insights that you didn’t know about! That’s why, in the first step of our feedback, we are actually measuring our customer satisfaction and happiness using ratings, also referred to as quantitative questions or metrics. That way, we have relevant and segmented questions to ask in a second step, in which our customer will neither lose any time nor get bored of too many irrelevant questions. Don’t waste your customer time, ask him the right question and get more relevant and actionable answers. We have just popped our customer happiness and satisfaction up with a nice, short and cool feedback form. How about we go further than that and make sure the relationship lasts? Shall we ask for his email (if we don’t have it) in order to re-engage later, follow-up, keep him posted about any upcoming update extracted from his feedback? That’s not all — is it? Instead of collecting the email, we might want to get a new testimonial, but we cannot go about that. We have sent hundreds of emails, but we only got like 2 or 3 testimonials. We could just ask the most satisfied customers for a short and sweet testimonial right after they received their reward. Just saying “Hey mate, you sent us your feedback, really appreciate it; we gave you something back, would you mind taking two more minutes to write up a testimonial that we could boast on our website?”. 90% of consumers read online reviews before visiting a business. How would you feel about preventing the bad ones to come? Or maybe it’s not relevant to ask for feedback, but you only rely on the online reviews madness. Okay, so let’s ask for a stunning 5-star review on Facebook, Google, Tripadvisor, Booking, G2crowd, AppStore, whatever the relevant place is. This can actually be done automatically using Feedier. So, whether you’re running an online business, a restaurant, a food truck, a hotel, a shop, this trick applies to you! You need reviews, so instead of asking for reviews first, let’s collect feedback and fix the issues first before they spread out, and then only ask our happiest customers for a review! In a nutshell, this process allows you to get more positive reviews, which attracts more customers, and tackle customer concerns privately before they turn into negative online reviews. This is important because bad experiences are more likely to be shared online than good ones, and you don’t want a few negative reviews to twist how customers think about your business. As you may have noticed, we are also increasing the word of mouth, attracting, and developing our brand awareness. As I mentioned above, there’s no magic number for you. Depending on your industry, survey type and who and when you are surveying, you’re likely to see a different response rate. For example, according to Benchmark, a good email survey open rate hovers around 10-20%. If you survey 1,000 people, this leaves 100-200 who may even click — not to mention complete the entire survey. That doesn’t mean there aren’t general benchmarks to use as your baseline. SurveyAnyplace’s research pegs the average email survey response rate at around 30% (not taking any other factors into consideration). What survey response rates are you seeing for the different methods? Leave a comment below to help others gauge. Surveys are a great way to gain insight into your customers’ needs. And that kind of data is a gold mine to any business owner. The details about your targeted customer base can be utilized in several ways which will directly or indirectly take your business profits to the next level. Your survey response rate will depend on a number of factors — there is no magic number. Take survey method benchmarks into consideration, but work to determine your baseline and start improving. The first survey you send to a customer may be the only one she opens. Make sure your putting your best foot forward by following the tips above. First, list your questions and possible responses. Remove whatever isn’t essential — the shorter the survey the higher response rate. Also consider incentivizing your respondents with something of value to encourage more thorough responses. Most importantly, make sure you are acting on the data gathered and analyzed as most of your respondents will want to see the output in one or the other way. Start for Free, and learn from our experts. Applying these tips will go a long way. Who knows, your customers might even send you a gift in exchange, give you a hug, recommend you, or give you a backlink? Special thanks to Maulik Shah, the Founder and CEO of AppJetty, for his contribution to the article and survey response tips. AppJetty is a software add-on store selling various technologies, including Survey Plugin For SugarCRM.